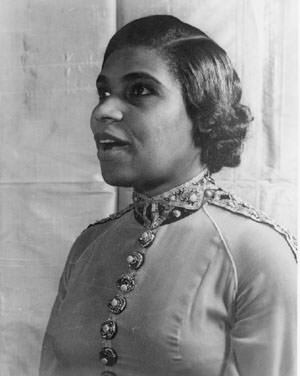 Born February 27, 1897, Marian Anderson was an American contralto. Being African-American, she faced many color barriers during her career but famed conductor Arturo Toscanini said she had a voice "heard once in a hundred years." In 1943, the Daughters of the American Revolution (DAR) recanted and invited Marian Anderson to perform in Constitution Hall. Her talent and drive opened doors in concert halls across the country. This collection includes known recordings of Marian Anderson including her performance at the Lincoln memorial, a guest appearance on A New World's a Coming, and additional recordings. See also Freedom's People. Be the first to comment on "Marian Anderson"